Spring Testing – Testometric Co. Ltd. 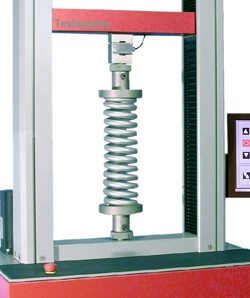 The Testometric AT-S and CT- S models are a range of dedicated spring testers based on the AT and CT Universal testing machines. They have internal capacity to store controlled test methods for several thousand spring types. These test methods are stored and recalled for use under a simple spring reference. Each method will control the whole test automatically taking the spring to desired positions and producing the calculations and results required. The large full colour display shows a real time load deflection plot of each test and displays, test results including free length, load at various deflection, deflections at various loads, various spring rates etc. Continually updated statistics also appear on screen giving highest, lowest and average value for each calculation. 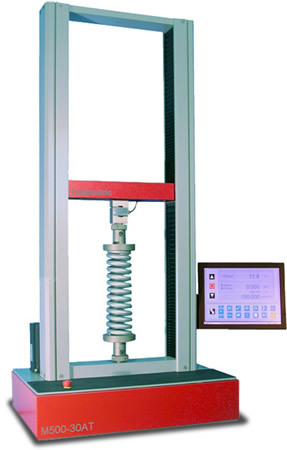 The system creates an ideal spring tester for either research or production testing. Machines are available from 100N to 500kN.